What a great summer I've been having so far. I was lucky enough to be gifted a trip to Oregon, my old stomping grounds, for a 10-day visit. I reconnected with old friends, some of whom I hadn't seen or talked to in 32 years, I visited with a former student of mine, made new friends and went to The Oregon Country Faire. What a whirlwind trip it was. I love flying into the Portland airport. 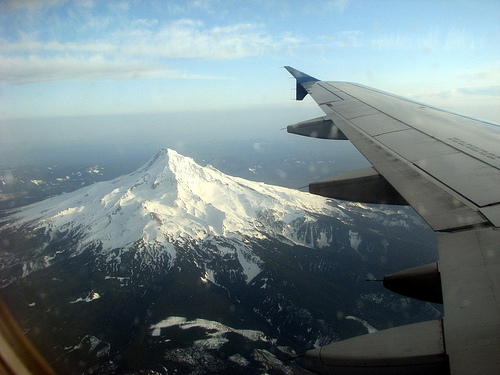 You fly right past Mt. Hood, where I lived for a few months, while my husband worked at Timberline Lodge, until I realized that I wanted to be closer to civilization to have my second child. At that point, we moved into the big city of Portland where we busked regularly, rubbing elbows and occasionally performing with Artis the spoon man, who taught my daughter her first string figure, and Tom Noddy, the bubble guy. Mt. St. Helens erupted while we were living there and occasionally spewed ash over the city. There was the first big eruption then a series of smaller ones as the mountain tried to build back it's dome. The volcanic ash is composed of silica and is very dangerous to breath, so we had to wear face masks if we went outdoors. Then we had to wet down the ash and shovel it into garbage bags to be carted away. If we breathed the ash, we ran the risk of silicosis, a disease similar to Black Lung Disease that coal miners suffered from. We were very careful. I even made my own version of a tiny mask for my son, who was just a baby at the time. The first big eruption had happened on May 18th, 1980, just when the weather was gorgeous, so it was pretty depressing with all the ash falling after a winter of rain. Even the doomsday prophets were out on the streets in force carrying placards and shouting, "Repent, the end of the world is coming." We went to see the Grateful Dead play at the Portland Coliseum on June 12th that year. As the band played "Fire on the Mountain," the mountain erupted. They finished up quickly and sent us all home scratching our heads and wondering what the rush was about. The bouncers were practically pushing us out the doors. As we exited, we realized that ash was falling. You couldn't drive in the ash. It clogged the air filter in your car, and the ash scraped the windshield if you ran your windshield wipers. We ended up with wall-to-wall Deadheads at our house that night. You couldn't even walk through the rooms without tripping over someone crashed on the floor. Though most of us were tripping and stayed up all night playing our own music. Soon after that concert, we had a chance to move to the coast and took it. We had many wonderful friends and really made our mark, though I didn't realized how much a part of the scene we were until I just went back. While living there, we ran into Ken Kesey, met Patch Adams and saw a real live unicorn at a Chautauqua, or traveling medicine show, that Patch Adams had organized. Luckily, I was able to find some of our wonderful friends this time back. One of them was living in his VW bus at the coast. I managed to find his daughter on Facebook and got directions to the street he was parked on. He was shocked to see me. I had found him to tell him a story of our trip back east that 32 years ago. We were moving back east and had bought a VW bus for $150 and were planning to drive it cross-country with our 2 children, our cat and all of our belongings. As we were leaving, he handed me a jar of old barn nails saying, "You never know what you might need along the way." I gladly took them and placed them in the toolbox. That bus broke down in every state across the country and, never stopping on purpose unless we were broken down, the trip took us three weeks. Crossing over the Rocky Mountains, the bus limped it's way almost to the summit and stopped. Paul, my former husband, and I jumped out and looked at the engine. The flywheel had been slipping and the slot that connected the two pieces was three times longer than it should have been. I suddenly remembered the nails, so we crammed them into the slot, preventing it from slipping and made it all the way to Ohio with that fix where we found a dune buggy shop called "Mud, Sweat and Gears." The guy there gave us three flywheels in trade for us helping out three stranded travelers at any time. That was an easy trade. There are so many stories from just that one trip, but I'm not telling them all here and now. My friend was thrilled to hear how it had all worked out. The bittersweet part of these re-connections was that no one knew about Paul's death, and I had to break the news to them. During that trip I rediscovered myself. I've been trying to get back to my own music and my own life without having to consider others. It's the first time in my adult life that I only have to take care of me, and it's liberating but also a little frightening. My visit to my past has helped set things straight.